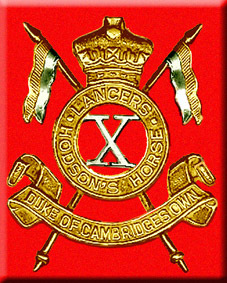 The 10th Bengal Lancers is one third of the original Hodson's Horse. William Hodson was serving on the staff of the Delhi Field Force in 1857 during the Great Mutiny. He was also commanding the Corps of Guides. Whilst holding these jobs he was asked to raise a regiment of irregular cavalry which came to be called Hodson's Horse. The gathering of wild men, brought in to join this force, in the vicinity of Delhi was a cause for concern, so Hodson had to relinquish his other jobs to take command of the regiment. The regiment went to the relief of Lucknow where Hodson met his death. Soon the force was so large that it was split into 3 separate regiments in 1858. The 3rd regiment was disbanded in 1861 and the 1st and 2nd regiments became the 9th and 10th Bengal Cavalry. In 1871 the 10th fought in Abyssinia. A squadron of the 10th went to Malta with the 9th regiment in 1878 while the rest of the regiment went to Afghanistan. Whilst in Malta the squadron was inspected by the Duke of Cambridge who was so impressed that he conferred his name on the regiment. In 1914 the 10th were stationed at Loralai. They were composed of one squadron of Dogras, one of Punjabi Muslims, one and a half squadrons of Sikhs and one half squadron of Pathans. They did not go to France but went to Mesopatamia where they took part in the capture of Baghdad.